$319.99 & FREE Shipping on orders over $59 $35. Experienced home brewers know all about the frustrations of grain husk falling through too-large perforations in their mash tuns or getting stuck when using a pump to recirculate the mash, but when you use the 15 Gallon Heavy Duty Mash Tun from MoreBeer!, you won’t have to worry about any of those common problems. 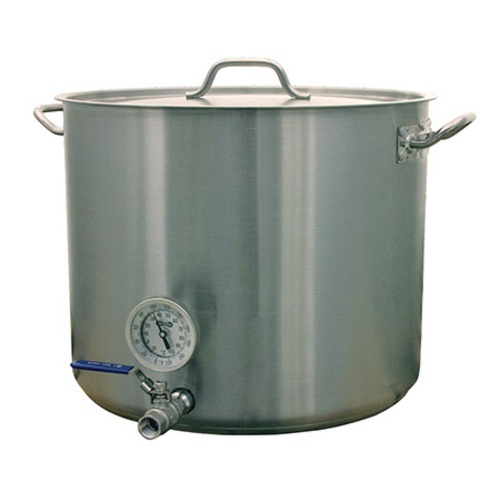 This state-of-the-art mash tun is made from one of our 100 percent stainless steel Heavy Duty Brew Kettles, but it also features two ½ inch threaded couplers welded on the side, a durable thermometer, a ½ inch full port ball valve and a false bottom to turn it into a convenient, preassembled mash tun. The bottom outlet on this mash tun contains male threads on the outside and female threads on the inside, while the rest of the kettle is constructed out of one seamless pieces of stainless steel that is entirely resistant to denting or leaking. The tri-clad bottom features an aluminum core sandwiched between two pieces of food-grade stainless steel, creating even heat distribution and preventing you from scorching your delicate mash. 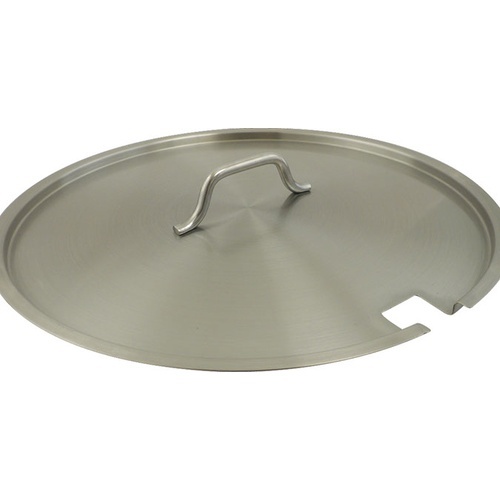 This 15 Gallon Heavy Duty Mash Tun even contains an 18-gauge stainless steel false-bottom with a perforation of 3/32 holes on 5/32 centers, ensuring that your grain husks stay perfectly in place throughout the entire mashing process. Our Heavy Duty Mash Tun is also available in a smaller 8 gallon size, or a larger 26 gallon size. 10 Year Warranty from MoreBeer! I bought it for doing BIAB 5 gal batches, needed 8-10 gallons of room for mash, then transfer to a smaller boil kettle. However, bought another mash tun so have started using this for 10 gal batch boils with 13-14 gallons of boil volume. Works great. I leave the false bottom in when I use Leaf hops, works like a screen. Thick bottom, never scorches even with full blast banjo burners. Cons: Heavy hard to hoist around for cleaning etc.. Thermometer level is above 5 gal batch boil volume so can't use it for 5 gal batch boils. Great quality pot. Very heavy duty . Not so good for a gravity brew system. kettle is so big around that it hangs off of my center of gravity system. Thermometer is way to high in tank 14 lbs of grain and it was barely in the grain. Holds like 3 gallon of water under false bottom. Very hard to hold a mash temp with this extra wide kettle. Going to buy a pump so I can recirculate while mashing that should help. I'm not new to all grain brewing I was brewer of the year in my club. Just saying would have been better if not so big around....and thermometer was lower. I love the sturdiness of this kettle. In fact, I bought a second one after replacing my boil kettle. These heavy duty vessels should last a lifetime with proper care and cleaning. However... as with pretty much every item you'll buy at a reasonable cost, it's likely made in China. The lower port on the mash tun I received was so poorly welded it was impossible screw anything into it. I was able to clean it up a bit after buying a 1/2" NPT tap, and got a hose barb screwed about half way in - enough to work. Morebeer customer service was very prompt in replying to my emails, and quickly offered to replace the whole pot at their expense. No complaints there. Though it would have been nice to give me some consideration for the tap I bought. Overall - a good product and great customer service. Overall, I love these kettles (I have 3 for HLT, BK and MT). The one thing that bummed me out was that the thermometer port is so high in the kettle you are stuck at 10 gallon batches (I was hoping to be able to do 5 gal batches too). Another thing: For 10 gallon batch sizes I'd go with 15 gallon BK and HLT and a 20 gallon MT, or for 5 gallon batch sized I'd go for 10 gallon BK and HLT and a 15 gallon MT. The bottoms, however, are awesome, the welded ports are great, the finish is brushed not buffed, but it's still nice looking. One thing is for sure, they'll last me a long long time. Once I get rid of my 15 gallon MT and replace with a 20 I'll be set. I recently upgraded to this mash tun. After reviewing the pro's and con's of each kettle available on the market I settled on the 15 Gallon Heavy Duty Brew Kettle w/ the false bottom from MoreBeer! This kettle is a beast. The walls are thick. The false bottom is solid, and fits tight to the side. The welds on the threaded couplers were good, and the design gave me some options for the pickup tube. Is it perfect? No, it's a little wider than I would like. Make sure to pre-heat the kettle or your mash temperatures could be a little hard to nail down consistently due to the increased mass of the kettle. I started with one for my mash, as I saved up I bought one for my boil kettle and then my hlt. The highest quality stainless and thick construction with sturdy handles.